Internationally registered aluminum alloy has more than 1000 grades, each grade has a variety of states, there are obvious differences in hardness, strength, corrosion resistance, workability, weldability, decorative and so on. 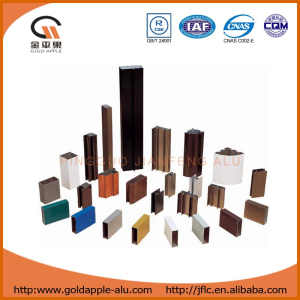 Select the aluminum alloy grades and status, the above aspects are difficult to meet at the same time, it is not necessary, should be based on product performance requirements, the use of the environment, processing and other factors, set various performance priorities in order to be reasonable Material selection, before the performance is guaranteed under the reasonable cost control. Hardnes:Aluminium extrusion suppliers think that many customers are very concerned about the purchase of aluminum, hardness and chemical composition of the first choice has a direct relationship. Second, the different states also have a greater impact, from the highest hardness can be achieved, 7 series, 2 series, 4 series, 6 series, 5 series, 3 series, 1 series, followed by lower. Hardness: Strength is the product design must be considered an important factor, as it is aluminum components as a component, should be based on the pressure to choose the appropriate alloy. The lowest strength of pure aluminum, and 2 and 7 series heat treatment of the highest degree of alloy, hardness and strength have a certain correlation between the next phase. Corrosion resistance: corrosion resistance, including chemical corrosion, stress corrosion resistance and other properties. In general, the corrosion resistance of 1-series pure aluminum is best, 5-series performs well, followed by 3-series and 6-series, 2-series and 7-series. Corrosion resistance selection principle should be based on their use of the occasion. High-strength alloy corrosion environment, you must use a variety of anti-corrosion composite materials. Machinability: Machinability Insert forming performance and cutting performance. Because formability and status, in the choice of aluminum alloy grades, but also need to consider the strength of various states range, usually high strength material is not easy to shape. Taiwan fruit to the aluminum bending, drawing, deep drawing and other forming, finished annealing the best formability of the material, on the contrary, the state of the heat treatment of the worst formability of the material. Aluminum alloys are poor in machinability and require good machinability for molds and machined parts. Conversely, machinability is poor for low strength, and the machinability of aluminum alloy is important for products requiring machining such as molds and machine parts Consideration. Weldability: Most of the weldability of aluminum alloy are no problem, especially part of the 5 series of aluminum alloy, is designed for welding considerations, the relative terms, part of the 2 series and 7 series of aluminum alloy is more difficult to weld. Decorative performance: Aluminum used in decoration or some special occasions, the need for its surface anodizing, painting and other processing, in order to obtain the appropriate color and surface texture, when the decorative should focus on the general and Said the words, good corrosion resistance of the material, the anode processing performance, surface treatment performance, coating performance are very good.